Dr. Clayton Schroeder, MD is a Doctor primarily located in Omaha, NE, with other offices in Omaha, NE and Elkhorn, NE (and 3 other locations). His specialties include Internal Medicine. He speaks English. Dr. Schroeder has received 3 awards. The overall average patient rating of Dr. Clayton Schroeder is Great. Dr. Clayton Schroeder has been rated by 33 patients. From those 33 patients 12 of those left a comment along with their rating. The overall rating for Dr. Clayton Schroeder is 4.3 of 5.0 stars. I started seeing Dr. Schroeder a couple years ago, and he is incredibly smart, compassionate, and even funny. He's very easy to talk to. I've seen other doctors in town, but I've never had such a clear explanation of my health and tests before. His staff is excellent and they obviously enjoy working together. I recently had a hospitalization and I was so relieved that Dr. Schroeder sees me in the clinic and the hospital. What better care can you get when your primary is the one taking care of you at your sickest? I recommend him to anyone who wants the best in healthcare. I had been seeing another Dr. for quite some time and wanted a change and was referred to Dr. Schroeder by my niece. It was the best gift that she could have given to her Aunt. He is truly a compassionate man and listens to what you have to say and takes the time to make sure that you understand if he is giving you directions. I am proud to say that he is my Dr. and knowing that his wife is an ER doctor shows that they both care about people and want to help them. You will not regret your decision if you choose him for your doctor, but this is all my opinion and maybe the bad reviewers were just having a bad day because I have never had a bad visit with him or had him not listen to me or not cared. Please see him and make your own opinion, I did and I am glad that I did! We are sorry, it looks like we don't have insurance information. Please call Dr. Clayton Schroeder's office for more information. 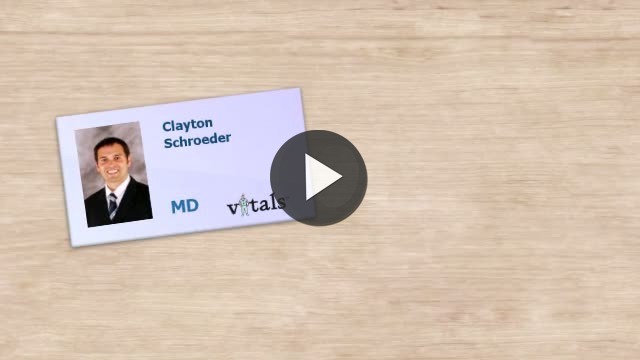 Take a minute to learn about Dr. Clayton Schroeder, MD - Internal Medicine in Omaha, NE, in this video. Dr. Clayton Schroeder is similar to the following 4 Doctors near Omaha, NE. Dr. Clayton Schroeder Is this you? Have you had a recent visit with Dr. Clayton Schroeder? Select a star to let us know how it was.